A big thanks to Chris Ferguson and Aaron Seward at Texas Architect for publishing this great article on the Griffin School in the May/June 2018 issue. Check out the print version or the digital version here. We are excited and honored to announce that Griffin School has won an AIA Austin 2018 Design Award. 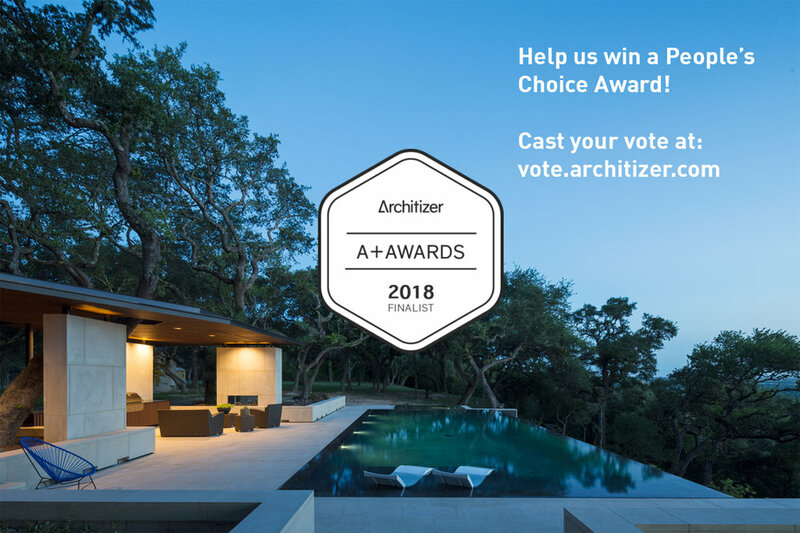 Thank you AIA Austin and a big round of thanks to our wonderful design team: Adam Wilson (of the Griffin School), Rizzo Construction, Leap Structures, Encotech Engineering, Studio Balcones, Civilitude Engineers, and Leonid Furmansky Photography. We also want to extend a round of congratulations to all the other design award winners. You can see their projects on AIA Austin's website. There will also be an exhibition of the work at the new Austin Central Library. La Grange Landscape Pavilion is featured as building of the week on the Swiss website World-Architects. Check it out along with a selection of great national and international projects. We are very pleased to announce that Rizzo Construction Inc has received an Associated General Contractors Austin Chapter award for their work on the Griffin School. It was selected as best building in the under $2,000,000 category. Congratulations to the whole RCI team, and a heartfelt thanks to Bob Rizzo, Jon Hunter, and Greg Jenkins for all their dedication and hard work on this project. Best of Design Award. Thank you to our great team: Owners Debby and Bill Schovajsa. Builders Sandy Vollentine, Shroyco Construction and Steel House MFG and TK Consulting Engineers. On behalf of our client SAFE|Alliance, we're honored and delighted to extend a huge thanks to Eastside Lumber owner Randy Meek for his generous donation of materials for the construction of the Eloise House expansion project. We have been working on the project pro-bono for the past year and Eastside's generous donation has made the construction of this important project possible. Randy is a huge supporter of local businesses and organizations. Over the years we've reach out to him for help with our for not-for-profit, education and charitable work and he has always jumped at the opportunity. Thank you Randy! Eastside Lumber & Decking is a full-line, full-service, locally-owned lumber yard located in East Austin. SAFE is a merger of Austin Children’s Shelter and SafePlace, both long-standing and respected human service agencies in Austin serving the survivors of sexual assault and exploitation, child abuse, and domestic violence. SAFE’s Eloise House is the region’s first 24/7 facility solely dedicated to administering FREE Sexual Assault Forensic Exams (SAFEs) to sexual assault survivors. When Eloise House opened its doors in 2015, it was expecting to see 100 survivors during the first year of operation. In the first six months, it served 300. And in 2016, Eloise House served 589 survivors. This expansion project will help expand SAFE's capacity to provide this critical service for sexual assault survivors.